Make your own takeout. 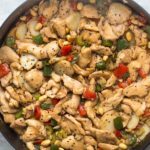 This easy Kung Pao chicken recipe is easy to make and tastes even better than delivery. Makes 6 servings. Happy Friday Gilmore fans! 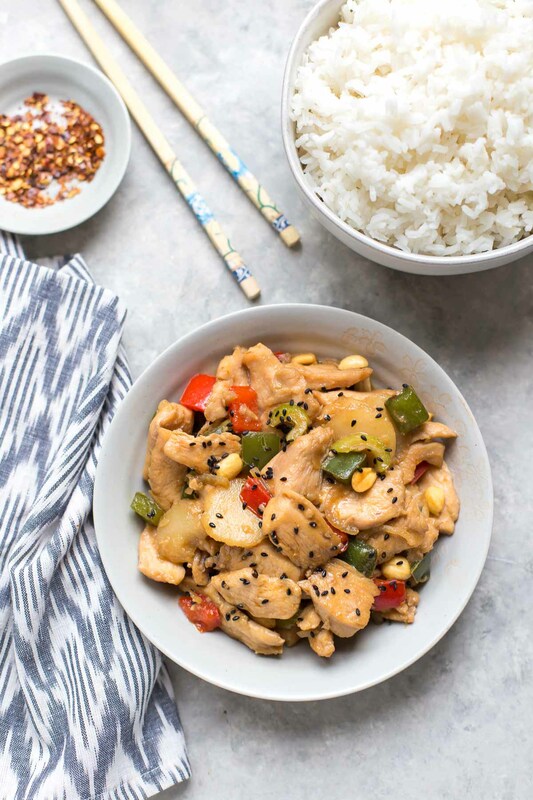 I’m back with another recipe for our Friday Night Dinner collection, and it’s a classic Chinese takeout recipe. It’s probably not even remotely authentic, but that’s okay because it’s easy and delicious. I had never actually had Kung Pao chicken until earlier this year when I was in Minneapolis for my friend’s bachelorette party. 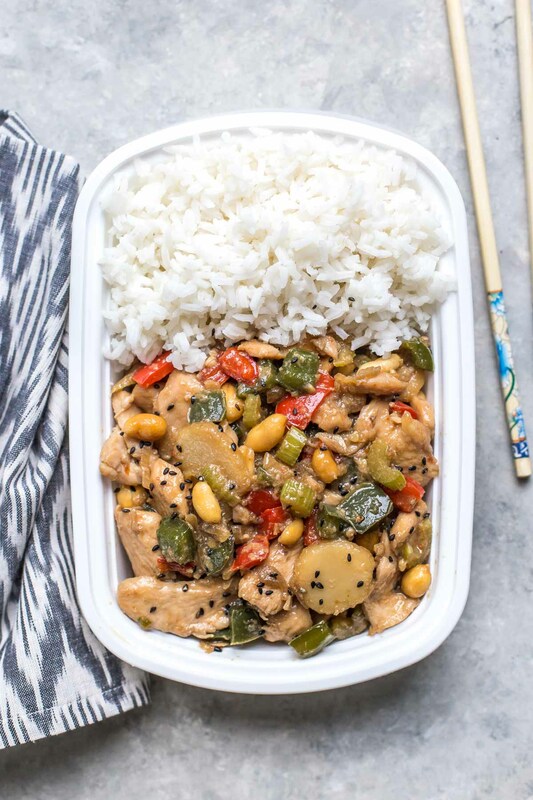 When it comes to Chinese food, I’ve always been partial to chicken and broccoli, but I was so impressed with my first experience that I ordered Kung Pao the next time I got takeout at home. After doing a bit of recipe research, I realized that what makes Kung Pao different from other Chinese takeout dishes, is the peanuts and the Szechuan peppercorns. They give the Kung Pao it’s unique flavor and heat. Unfortunately, Szechuan peppercorns are a little hard to find around here, and I didn’t want to make a trip to our specialty market, so I ended up using a mix of crushed red peppers and freshly ground peppercorns. 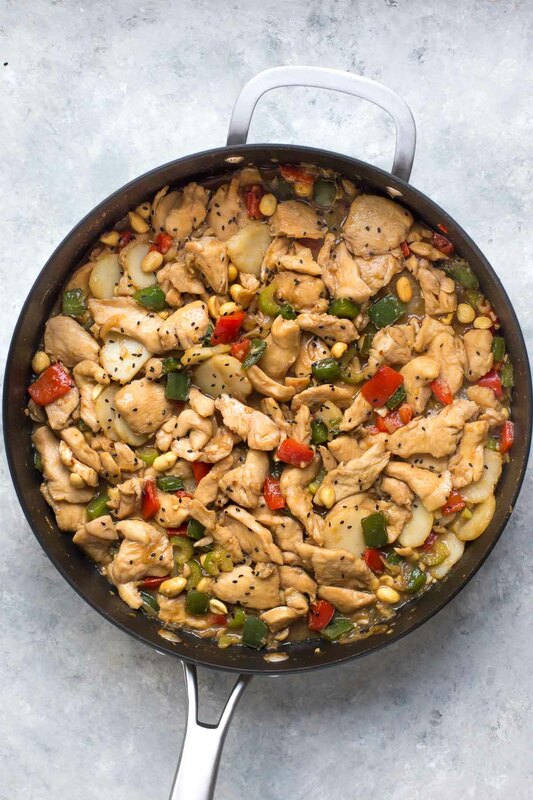 What other ingredients are in Kung Pao chicken? 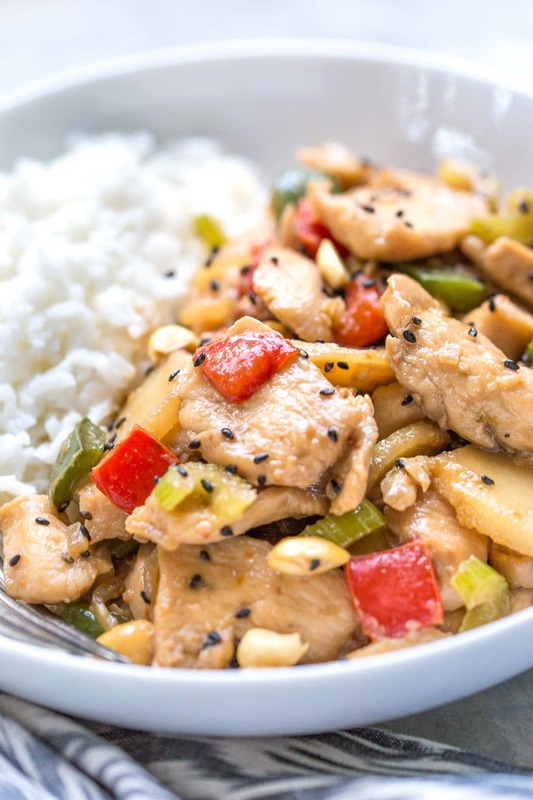 The ingredients in Kung Pao chicken vary from restaurant to restaurant, but they all consistently have peanuts, bell pepper, celery, onion, and garlic and ginger. Most recipes call for green onion, but I decided to go with shallots, because that’s what I had on hand. The shallots have a mild and sweet onion flavor, so they work just as well. Feel free to interchange them for this recipe if you have a preference or have green onions you want to use up. 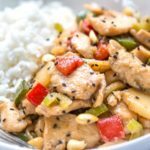 How do you make Kung Pao chicken? Start by getting all your ingredients chopped and ready to go. I always start by chopping my veggies and measuring out my liquid and dry ingredients, and I chop the chicken last. Next, marinate the chicken in soy sauce and cornstarch/baking powder. 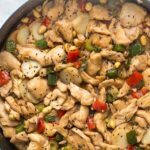 I consider this the lazy way of velveting chicken – a process used in stir frying that involves blanching the coated chicken in water or oil. I just don’t think the process is realistic for an easy, weeknight meal to actually velvet the chicken, so I marinate instead with the coating instead. Plus, the baking powder adds a wonderful texture that mimics Chinese takeout. You don’t need to marinate for too long either, 15 – 20 minutes should be more than enough time. Next, stir fry the ginger, garlic, chili flakes and shallots until they’re translucent and fragrant, about 5 minutes. Then add the celery and peppers and cook until they’re slightly softened. Add the chicken and cook until it’s no longer pink. 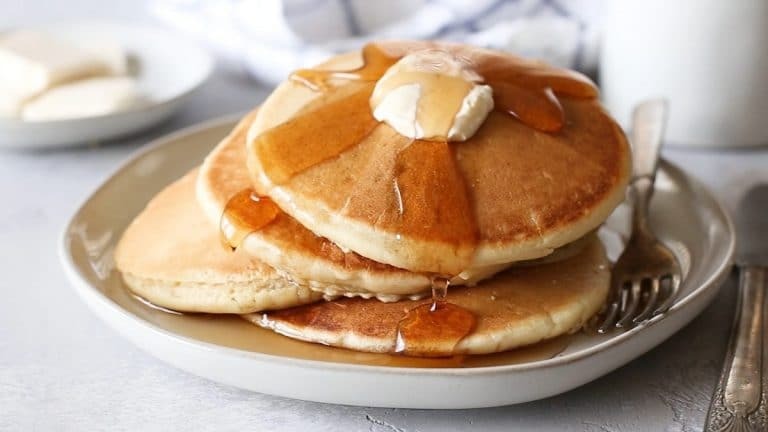 The baking powder should foam slightly when it meets the heat in the pan, but this is totally normal and contributes to the flavor and texture of the recipe. Stir frequently to prevent the soy sauce from burning in the pan. Next, add the sauce, water chestnuts and peanuts, and cook until heated through. I also like to add black sesame seeds for a little visual interest. I absolutely love the crunch the water chestnuts add to this dish, but the restaurant we went to in Minneapolis served theirs with bamboo shoots and it was really, really good. I have tried this recipe with both, and I like it either way. Even a mix between the two would be great. Use whichever you prefer, or you can leave them out all together. Want to make this gluten free? Simply swap the soy sauce for your favorite tamari. In a large bowl, whisk together the sauce ingredients. 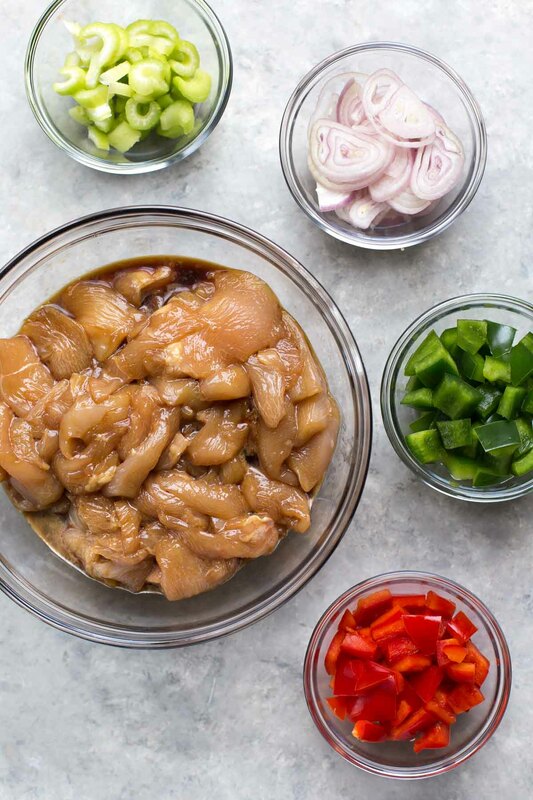 Add sliced chicken and marinate for about 15 minutes, or until ready to cook. In a medium bowl, whisk together the sauce ingredients. Set aside. 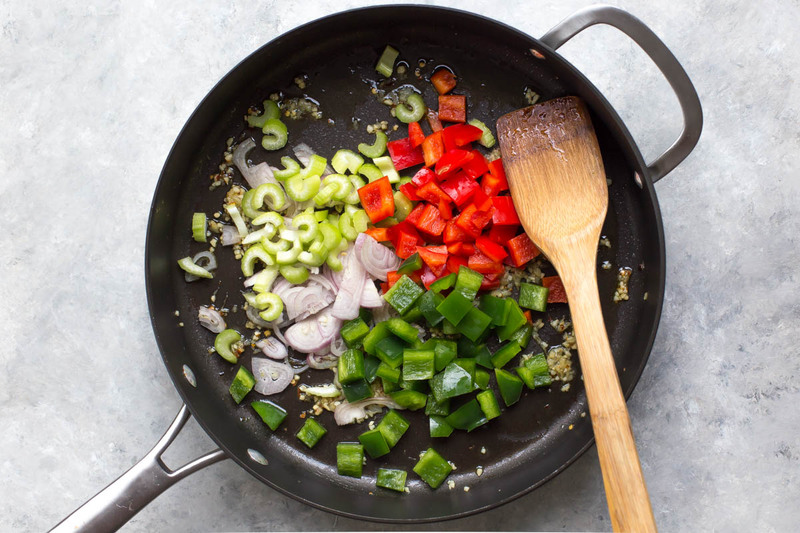 Heat a large skillet or wok to medium-high. Add olive oil, shallots, garlic, ginger, pepper flakes and cracked pepper. Sauté, stirring occasionally, until shallots are translucent, about 5 minutes. 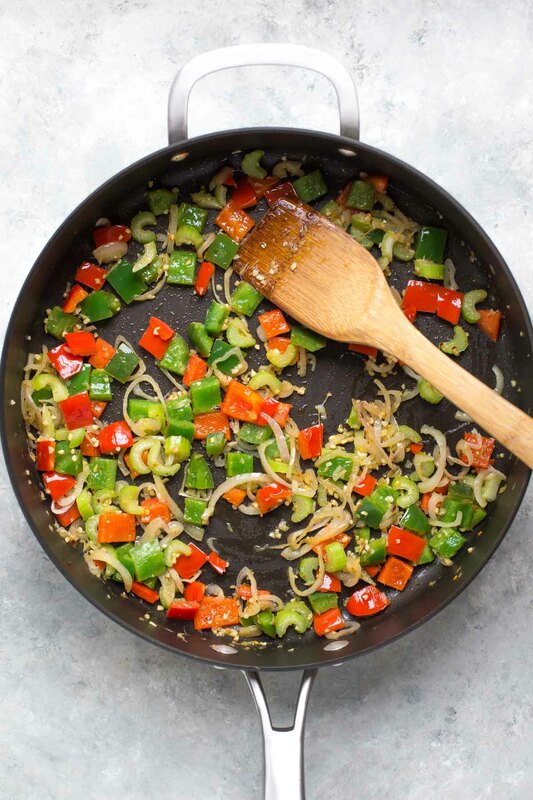 Add celery and bell pepper. Continue to cook, stirring as needed until vegetables have softened slightly, about 3 minutes. Add chicken with marinade and cook until no longer pink, stirring occasionally to prevent burning, about 5 minutes. Add sauce, water chestnuts and peanuts. Cook until sauce has thickened, about 2 minutes.